The next morning we woke up to another constant drizzle outside. The rain simply was not in any mood of stopping. As we made our way out of the tent to see how it looked like outside, we heard some shouting and commotion in the far distance. Immediately our guide also got out to see what was going on. Later he explained what we had seen. Apparently some of the locals regularly smuggle a weed called Dagga from neighbouring country Lesotho through the mountains into South Africa. And they often mistake hikers and tourists for cops. So, the commotion we had heard was them spotting our tents and then making a run for it. They don’t come and attack or anything, they just run as far away from onlookers as possible. So we had a nice chuckle about this. 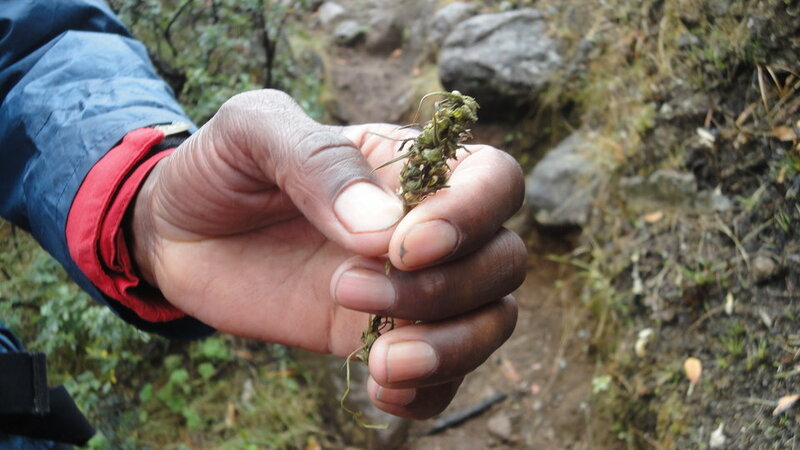 The guide also showed us smoke billowing out from some sections in the mountains where this weed was being smoked. Walking in the mountains is actually not as difficult as it appears to be when one stares at a mountain. All mountain slopes have wide enough paths that the locals have been using for years to cross. So we kept walking along the long and winding paths, up, down and around one mountain to the next. 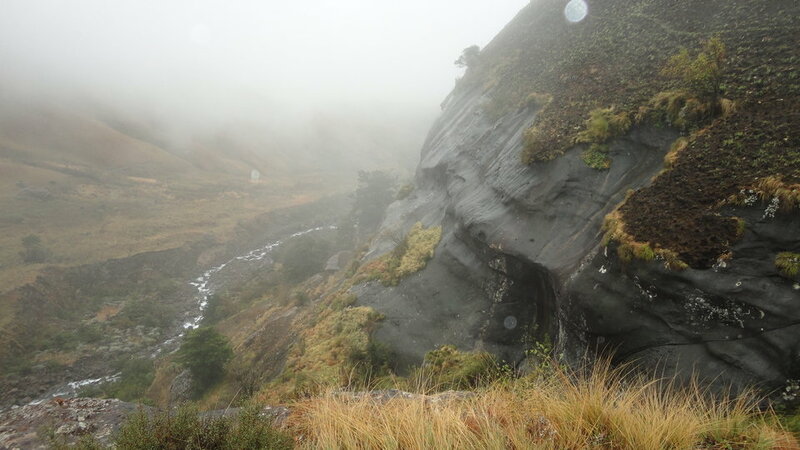 On the way we passed caves (where hikers usually take shelter and even stay the night), interesting rock formations, beautiful waterfalls, steep drops and lots of heavy mist floating up and down the valley, seemingly having a mind of its own. We were reminded of Tolkien’s misty mountains and many a Led Zeppelin song. 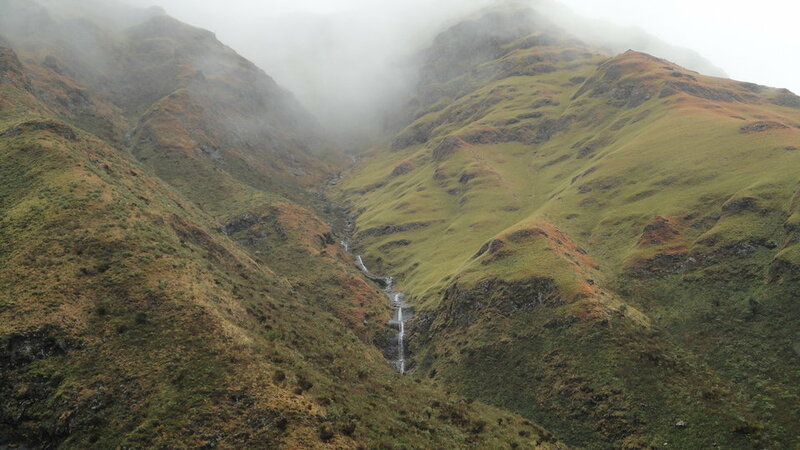 The scenery was stunningly beautiful and the mist made it look even better, although we knew that the more the mist, the more the chance of the rain not stopping. 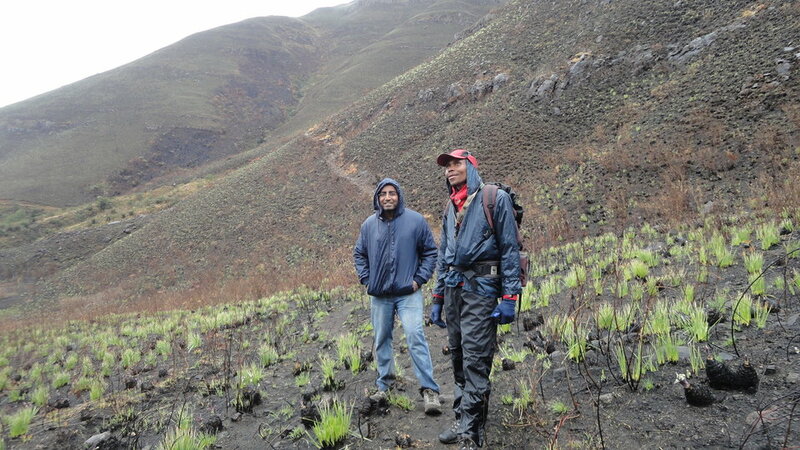 But the rain did stop in the middle and we were actually somewhat hopeful of making it all the way to the summit. 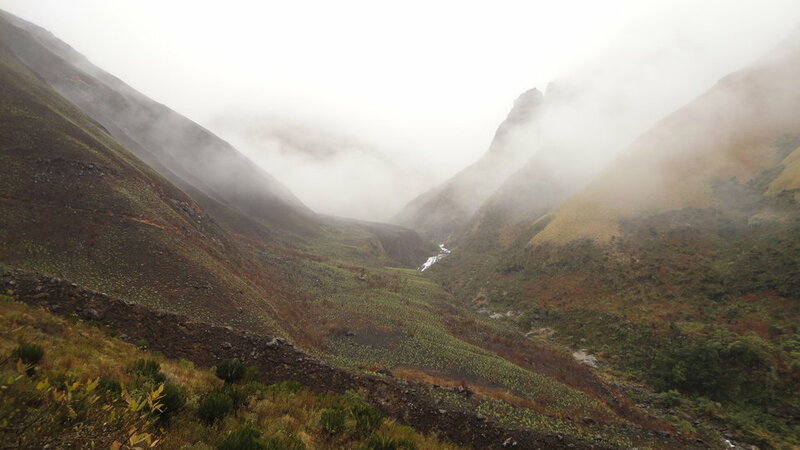 Finally when we were not all that far from Rockeries pass, the guide showed us how the mist was very heavy around the pass and that it may not be safe to cross if it suddenly decided to rain again. We were a bit disappointed of course but we thought it is better to be safe than over-ambitious on our very first trek. So we stopped right there for about half an hour or so and had some boiled eggs, an apple and some fruit juice. After taking plenty of photos in all possible directions, we started on the journey back to the base camp. The rain started steadily increasing again and we could hear some thunder too from time to time. As we made our way back, there were a few places where either the mud was very slippery or there was hardly a wide enough path in front of us. So at certain times we had to grab hold of as much grass as possible on the mountainside in order to not slip. Our shoes did a great job though! Just before this hike we had bought good quality hiking shoes and this return journey provided plenty of proof why it is so important to get hiking shoes and not try to manage using running shoes. As we reached the camp site, our main guide said to us that a big storm was coming and that soon the whole area would be covered in snow! Originally we had planned to camp for one more night but we had to modify that plan. Otherwise we would be stranded in the snow for god knows how long. Also, we had some winter clothing but it was not quite enough for a storm of this size. 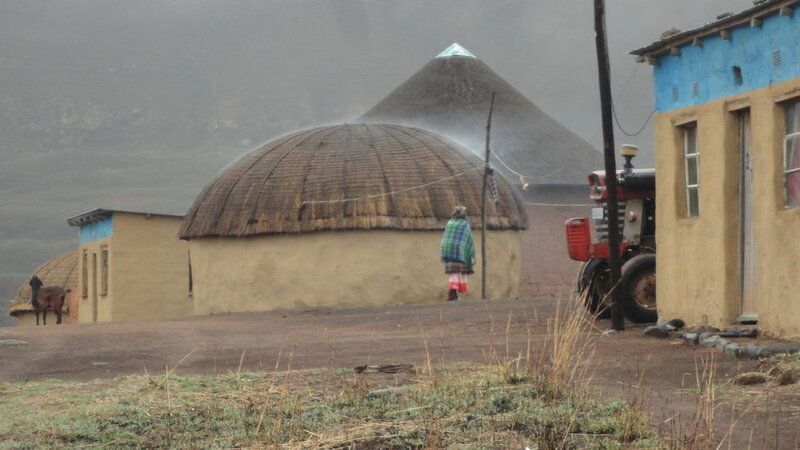 And so almost immediately we started on the journey back to Mnweni Centre. Both guides folded up the tents and we packed our bags. The plan was to back-track the whole route and maybe stop briefly at the river where we had had our breakfast the previous day. When we reached the river, it was overflowing. The rain was heavier now and the water flow was much stronger than before. So, instead of crossing the river and taking the same route as before, we took an alternate route. This route proved to be one of the most adventurous things in the whole trip! It went on and on forever and walking in the freezing rain was becoming harder and harder by the minute. To make things worse, we suddenly came to a part of the mountain where there was no distinct path at all in front of us. We literally had to grab hold of as much grass as possible on the mountain side and slide down to the next faintly visible path below. It felt like we were going to slide down the mountain in a free-fall. After what felt like an eternity, we finally got to some relatively level ground not that far away from the homesteads that we had passed on our way here. My legs were killing me at this point! Thankfully I did not have any sprain or fracture, though I did slip and fall a couple of times. But my knees, especially the right one for some reason, were aching continuously with every step I took. I think what had happened was, we got no rest whatsoever from the time we came back from the higher mountains to the base camp. 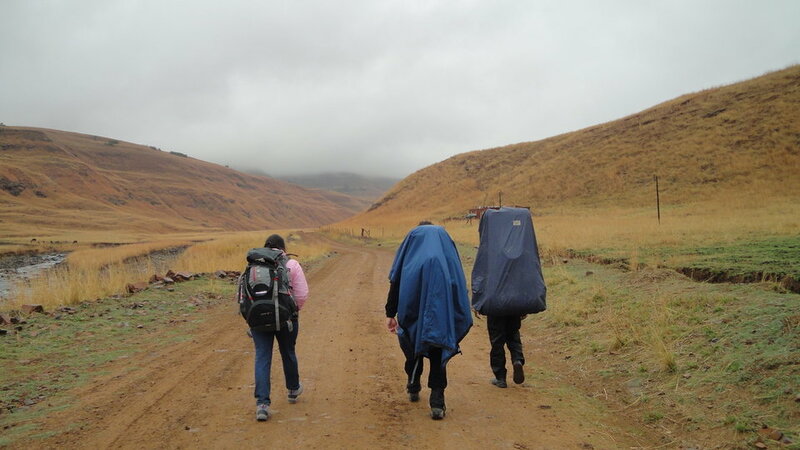 As soon as we reached the camp, we had to start walking again immediately because of the approaching storm. So all this took its toll on my legs and I basically limped the whole way back to the Centre. My wife surprisingly seemed fine compared to the state I was in. But both of us were clearly visibly exhausted from the hike, the freezing temperature and the endless rain. Meanwhile, we saw our guides happily walking back with the same 20 something kilos on their back as if nothing had happened. I suppose that is what regular hiking in the mountains does to you! 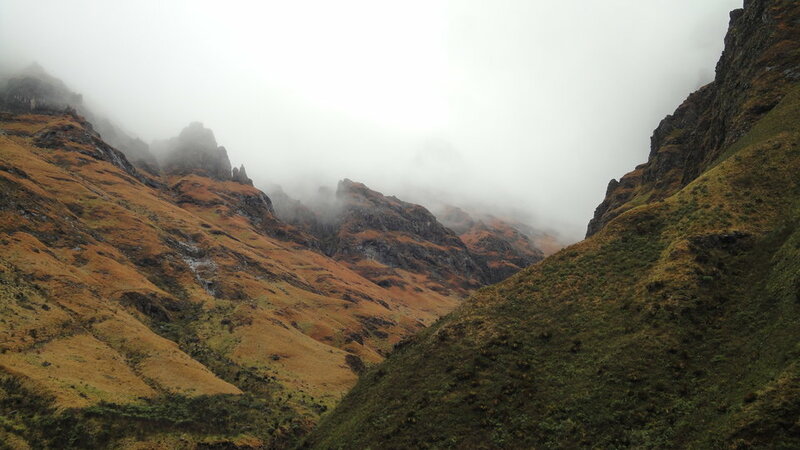 As we walked back, we turned around to see that the mountains were now completely covered in mist. As we got further and further away and back on the road to the Centre, snow started falling over the mountainous horizon. What a sight it was! Every time we turned around to look, more snow had fallen on the slopes. They were getting whiter by the minute and it was getting easier to distinguish the mist from the snow. The place where we had camped overnight was now covered in white! We were thankful to the guide for having good judgment and saving us from the storm. But a part of me still wished that we had camped in the snow. 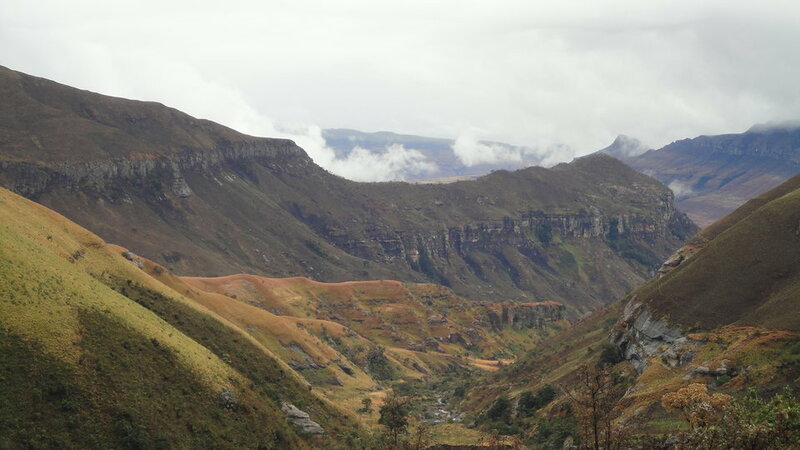 Nonetheless, a brown and green landscape with snow-capped mountains in the horizon was the image lingering in our minds as we reached the Mnweni Centre. So that’s the story. Sorry for writing such a long account but I wanted to describe our first hiking experience in detail. There are still things that I have left out but I could go on and on if I wanted to. The bottom line is that, despite the fact that we ran into unexpected and unfriendly weather which cut short our hike from 2-1/2 days to 1-1/2 days, we still enjoyed it very much. 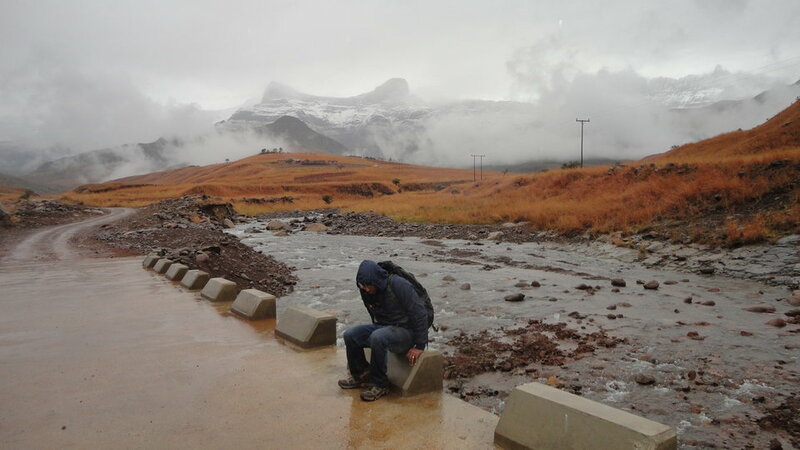 Even if we don’t head back to the Drakensberg for a while now, we want to start doing more day hikes in our own area. After all, it is a great way to stay healthy at a reasonable cost while also catching some lovely scenery along the way. 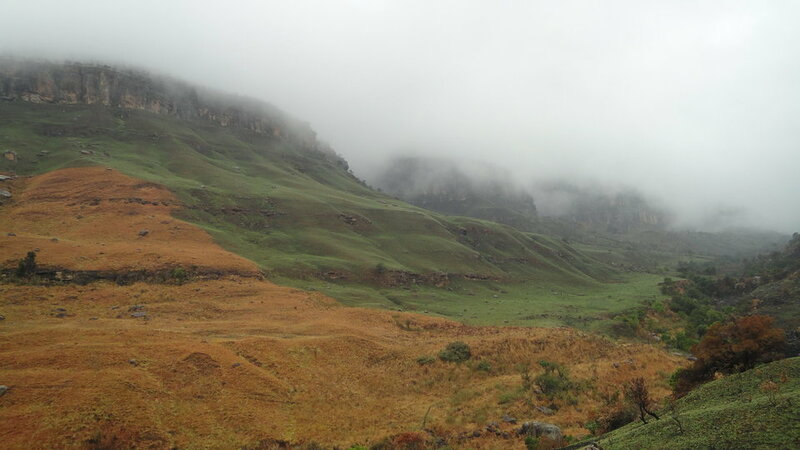 We’d been wanting to hike in the Drakensberg mountains for quite some time, so we finally went and did it last weekend. This was our second time in the Berg. The first time though, was purely a tourist visit to Champagne Valley and Monk’s Cowl. My mom and sis were visiting at the time, so we did not want to attempt any hectic hikes. Ever since that first visit when we saw the stunning beauty of the area with our own eyes, we had been dying to come back for a proper hike. It finally happened in September 2012. I took a Friday off from work and we set off on the road Thursday afternoon. It was roughly a 5 hour journey covering 450 km to the small town of Bergville. 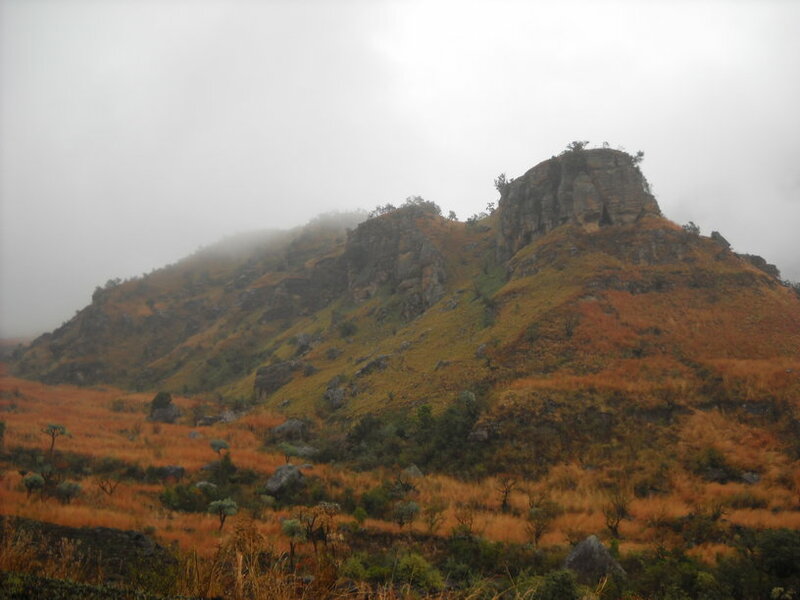 From there it was about 35 km to an area called Mnweni and this included 17 km of unpaved dirt road. 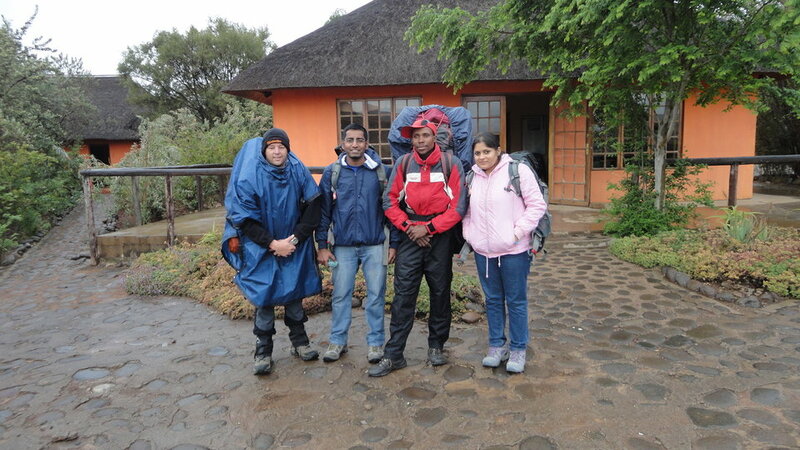 After getting a bit lost (which seems like a normal occurrence now especially in the Drakensberg) we finally reached the Mnweni Centre where we met with our guide and porter. The plan was to stay the night there and then start on the hike the following morning. We had our dinner quickly, which consisted of sandwiches that my wife had packed for the evening and then went to bed in our rondavel (traditional African hut). 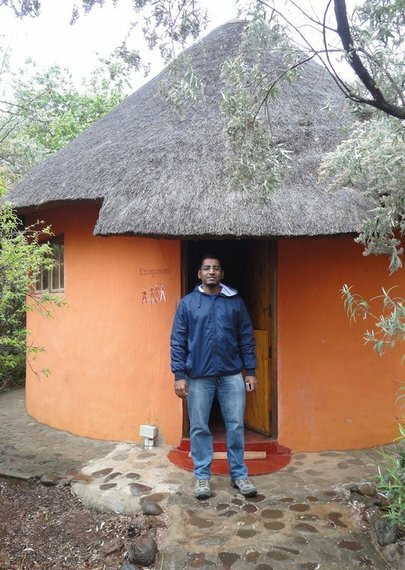 Though there was no TV in the room and no plug points, it was good, basic, reasonably priced, self-catering accommodation. The next morning we woke up early to get ready. A light drizzle had started outside. After having a quick breakfast of oats we started on the hike with our guide and porter. We had found the guide from the internet and he arranged the porter, a local from the area who also acted as a guide as well. Both my wife and I had backpacks weighing 5 kilos or so and these guys had huge backpacks weighing maybe 20 kilos each. They brought everything for us, food for the journey, cooking utensils, tents to sleep in, sleeping bags, air mattresses and so on. At around 8:30 am, we headed from the Centre on the dirt road towards the mountains. This was my first time out on a proper hike. I had done a few runs and walks before but they were all on level ground. This was in the mountains. Makes a big difference! After walking about 5 km or so I was already tired from the weight of the backpack and the uphill road. Thankfully we stopped every now and then for 5 or 10 min and took photos and stuff. So it wasn’t too bad. The scenery got better and better as we reached closer to the foot of the mountains. We passed several settlements and homesteads, all sporting the typically round huts, a rooster and some cattle. It was interesting to see how the locals lived in this area. One thing that was funny to see was that some of these homesteads, no matter how rural and impoverished they looked, had visible satellite dish connections. I guess that’s the scene in a country which is both developed and developing. Also, our guide explained that these people get utilities like water and electricity as well as other things like education and medicine all subsidized by the government. After about 11 km or so of walking, we stopped for a quick brunch by the banks of the Ntonyelane river. 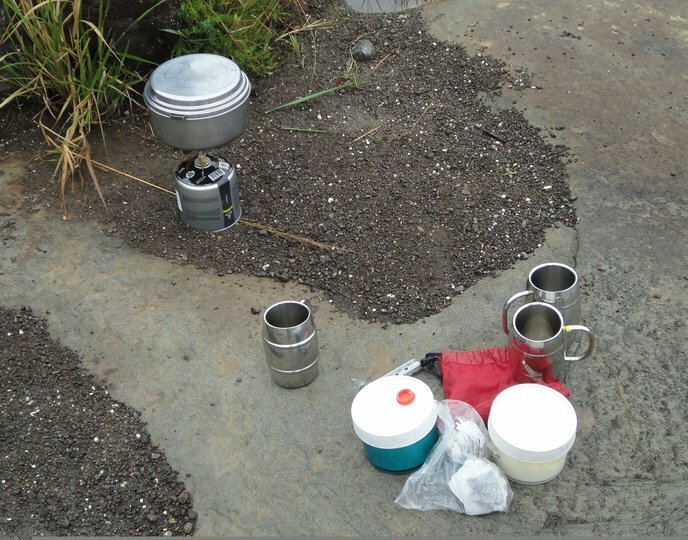 The guide prepared some buns with cheese and tomato and gave us 2 hot mugs of coffee. That was a much needed break. Then we headed on towards the area where we would camp for the night. The path was really interesting and the mountain scenery just kept getting better and better. Since it was in-between seasons, we saw plenty of brown and green. In a few areas in the mountains, the demarcation between dried brown grass and lush green grass was striking and this made it look beautiful from a distance. 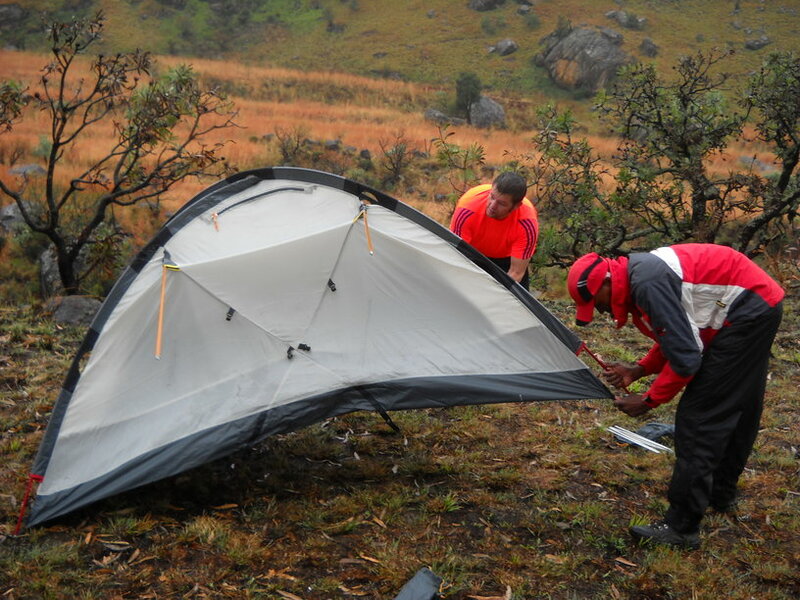 Finally we reached a relatively flat area where our guide decided to put up the tents. It was a lovely spot with more scenic mountains ahead of us and a cliff to some distance to our right overlooking the same river that we had crossed earlier. Actually we were going to camp even further along the route but the ever increasing rain and the fact that we were inexperienced hikers made the guide decide to stop where we were, even though it was only around 2 pm now. For the rest of the afternoon and evening we spent our time in the tent, reading books, sipping on coffee or tea, having noodles and generally staring at the rain and wishing for it to stop. 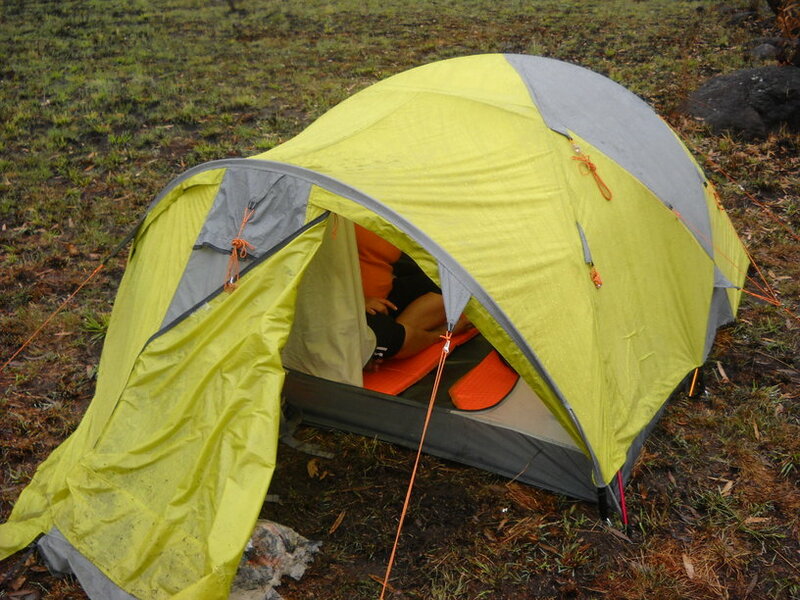 Staying in a tent overnight was quite an experience! As the sun set, it got pitch dark outside with nothing but the sound of birds and the occasional growls of baboons high up in the mountains. Our guide assured us that these baboons do not come down the mountain towards humans, unless we specially attract them with fire or food. So we were not that scared or anything but it was still a bit unnerving sleeping on a grassy mountainside out in the wild. The one thing that we missed dearly was a starry night sky. The relentless rain had covered the sky up with clouds. 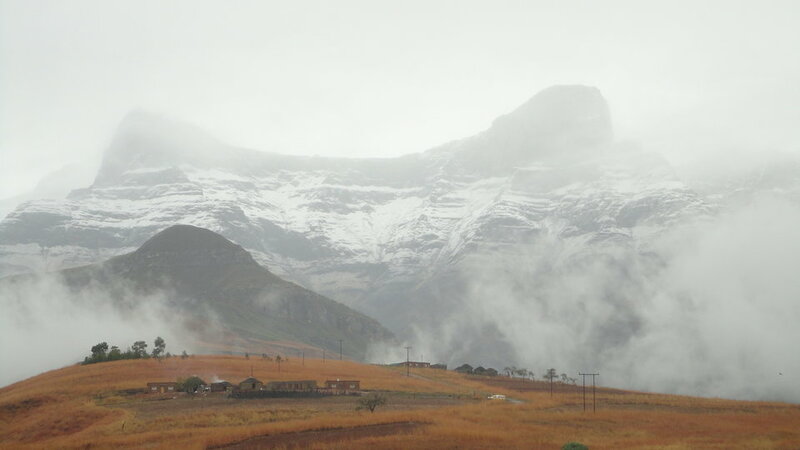 That’s the thing with the weather in the Drakensberg. They say it can change in a matter of 5 min. Anyway, since we were in a well-protected tent, we did not get too wet or anything. Plus, we had raincoats. In the middle of the night if we had to pee, we had to go outside the tent in pitch dark, quickly finish the job and scurry back in. And of course, twisting and turning around on the thin air mattress did give us its share of back pain. But one can’t complain too much. 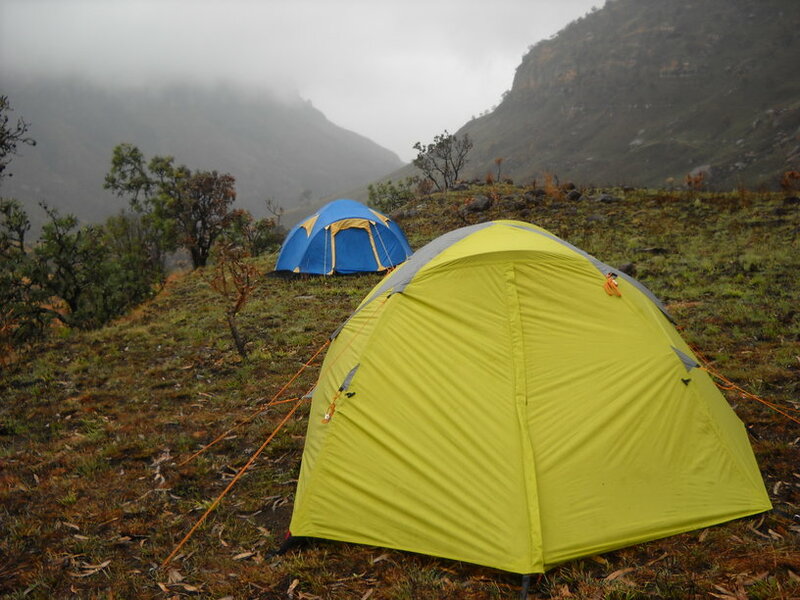 That is what you get if you want to experience sleeping in the wild.